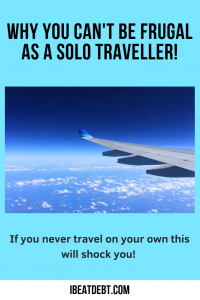 I am a solo traveller! I don’t drink apart from special occasions and I don’t smoke, but my vice (apart from Diet Coke) is travel and holidays. 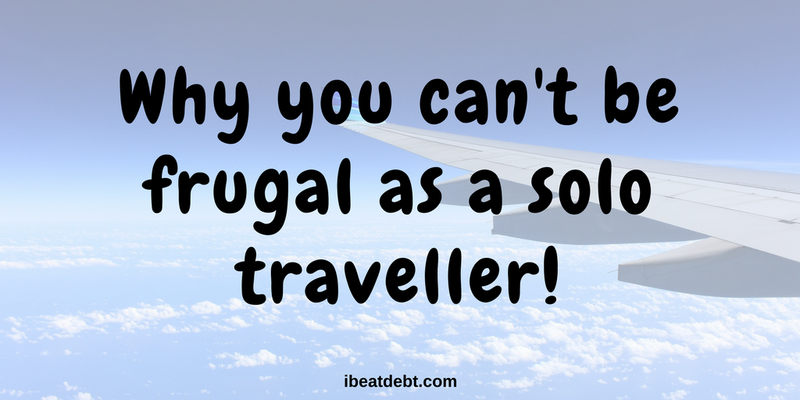 It is however impossible to be frugal if you are a solo traveller. 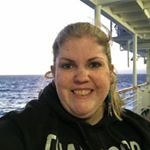 I try to save up so that I can have one nice holiday a year, and I’ll be honest, I do love cruises, but I still end up paying way more than anyone who is travelling with a friend, partner, or anyone! I just haven’t found any good value for money singles vacation packages. I got the cruise bug from my parents. There is plenty to do, you can see different places without unpacking and repacking and you can meet great people and feel really safe (which as a solo female traveller is a massive bonus). Usually I plan a good year in advance, but as I moved house last year I haven’t booked anything for this year yet, it is almost impossible to get a late deal as a solo traveller, as the industry just doesn’t cater for us as a priority so I just keep checking online to see if I see any great deals. It’s not good reading for us solos! ‘I started looking around and soon found myself annoyed! I started over at NCL (Norwegian Cruise Line)’s website. This isn’t meant as an attack on them – I’ve been with them several times and always have good holidays, but I am being ripped off and I’ll show you how! 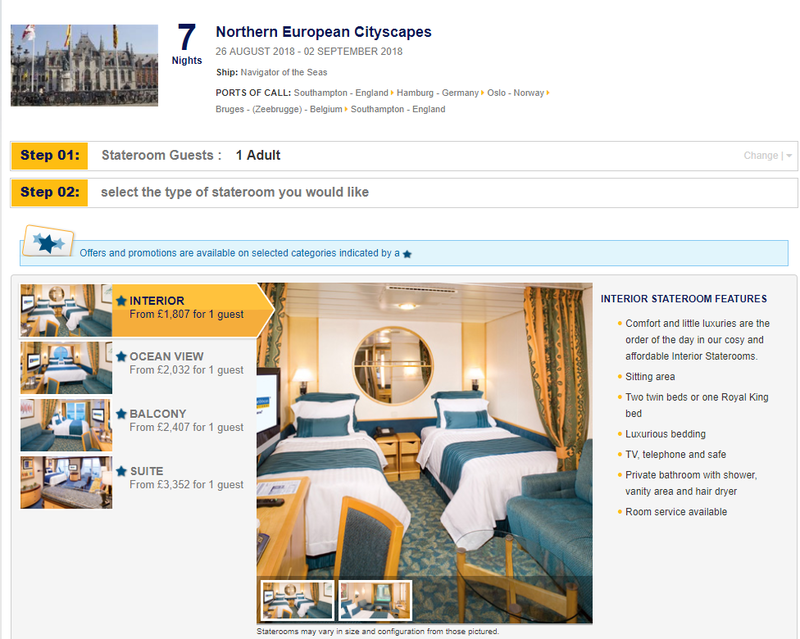 I saw a cruise advertised at “from £559” and so thought I’d check it out. In the first picture below you can see that I entered the details as sailing on the 8th April on on the Norwegian Getaway. This is sailing out of Florida, so I would have to pay for my flights – but I have been saving my airmiles so this would have been on a budget and I would have to pay it anyway. I entered that two guests would be sailing and The Studio cabins were not offered as they were designed for solo travellers. 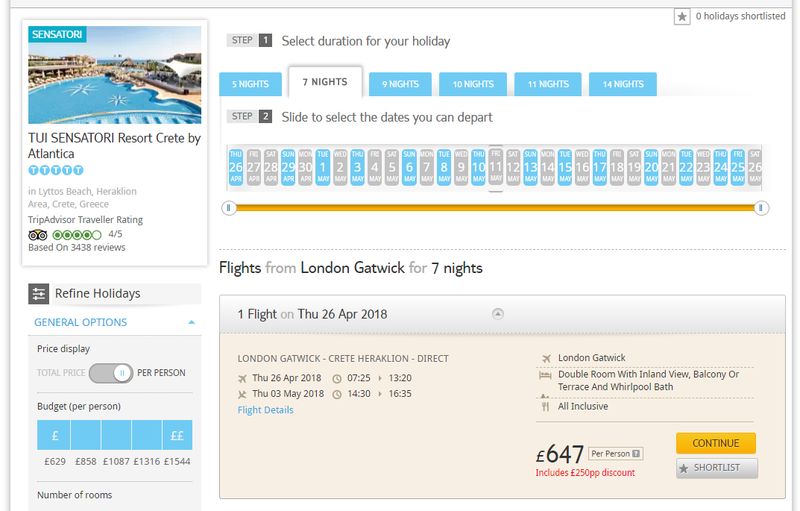 The cheapest option for two people travelling on this trip would indeed have been two people sharing an inside cabin at £559 each. I then went back and edited it for one person travelling on their own. The solo travellers cabin option was now enabled however you can see that their cabins designed for people travelling on their own and with “no single supplement” actually would be more expensive than being in either an inside cabin or an Oceanview cabin. For just £32 more I could have a balcony (if I was going to spend that much). 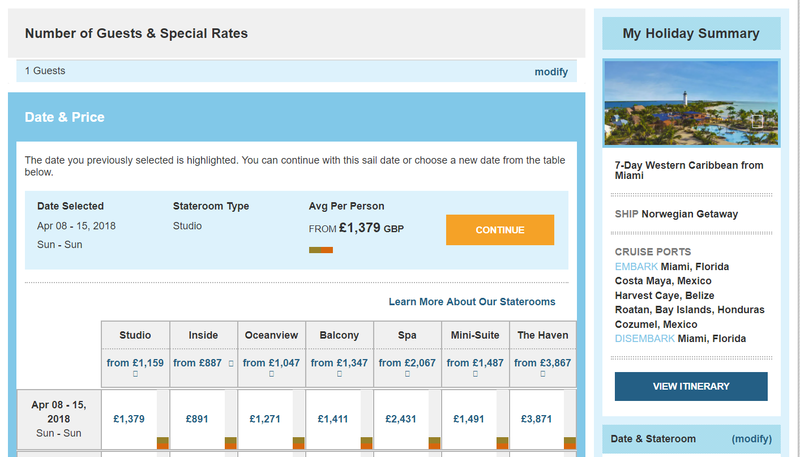 My cheapest option would be £891 – but that is still £332 more for travelling on my own! I mean I know they could make more money if two people are in a cabin but that just doesn’t seem fair. I then decided to rethink my options and look at trips from the UK as I’m not sure I want to use all my airmiles at the moment. 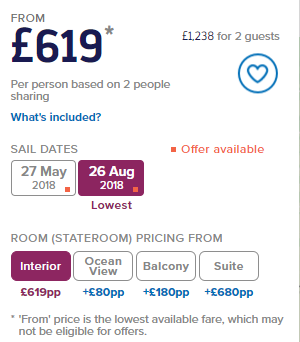 I know Royal Caribbean have lots of great offers so again, I went through and priced up a trip as though I was travelling with someone else. It came to a total of £1278 for the two guests (£639 each) and very close to their advertised “From £619” price I’d seen advertised. So, as you can probably guess, I then priced it up for just little old me going. 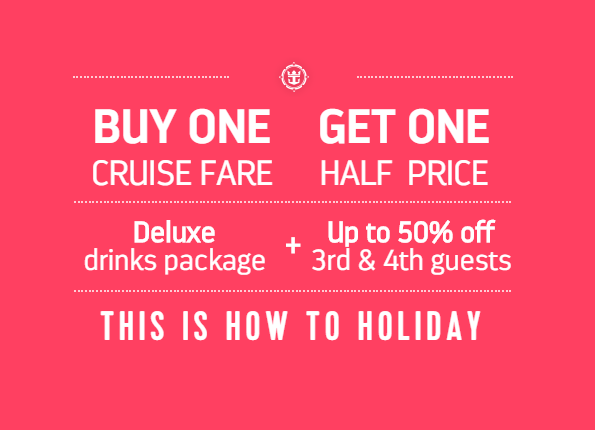 Now, to be fair to Royal Caribbean, they do have a promotion at the moment – “Buy one, get one half price on cruise fares” so I thought there would be a reasonably big price difference but what I found blew me away! For just little old me the total came to £1,807! That’s nearly three times the price! I can almost get my head around being charged twice the price because effectively the company/hotel are losing out on money if it isn’t full, but THREE TIMES! I mean I know there’s a promotion, but why can’t it apply to solo travellers too? I’m so sick of being penalised. I sometimes go away with friends or family but on the whole I do travel alone. I do this because friends and I might have different annual leave options or availability, different budgets and different ideas of what we want to do on our holidays. Sometimes I just want to get away from it ALL and have some time to myself but I am being penalised because of it. It’s not just cruise companies that do this. I repeated my experiment on various travel websites doing various different types of holidays in a wide range of destinations, and at the end of the day, to travel alone you will pay a LOT more. 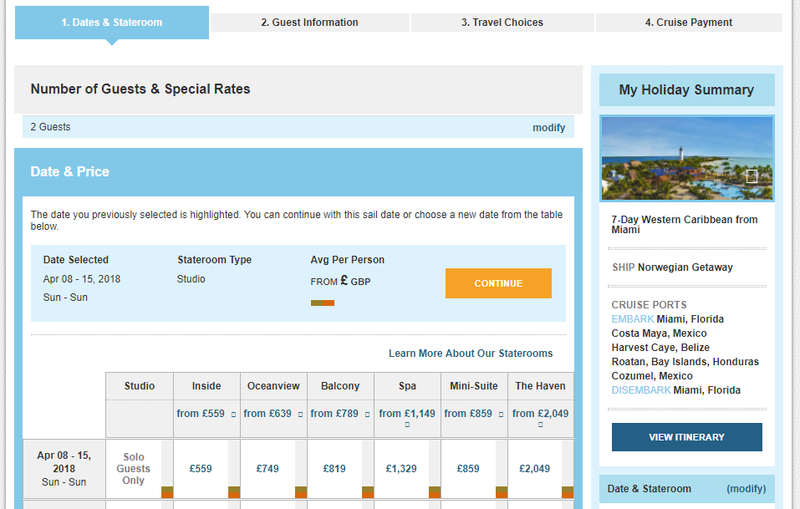 I accept I need to pay a bit more because I have extra space, but come on holiday companies, stop ripping me off! I’ll leave you with a few more examples of how much more expensive it is to travel on your own and why you can’t be frugal as a solo traveller! 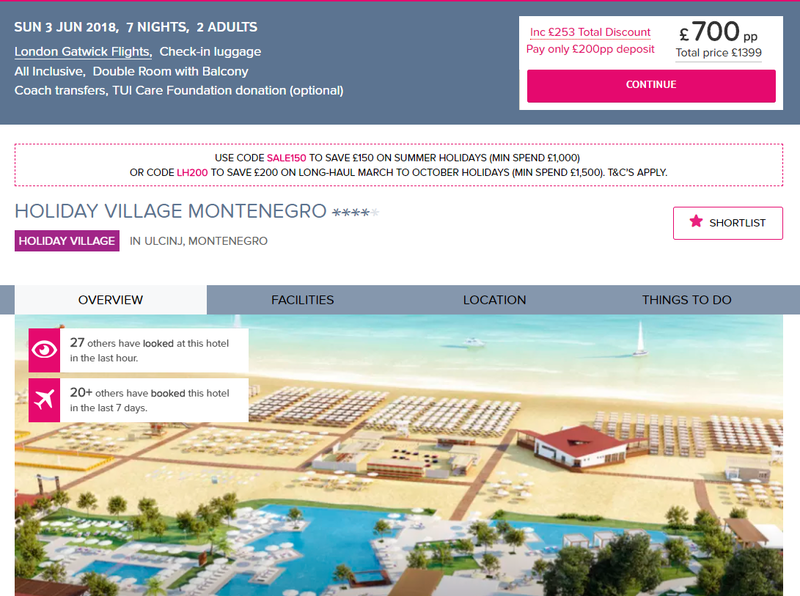 Same holiday, all inclusive in Montenegro – £700 per person if I travel with someone else, £1137 if I go on my own – costing me an extra £417! 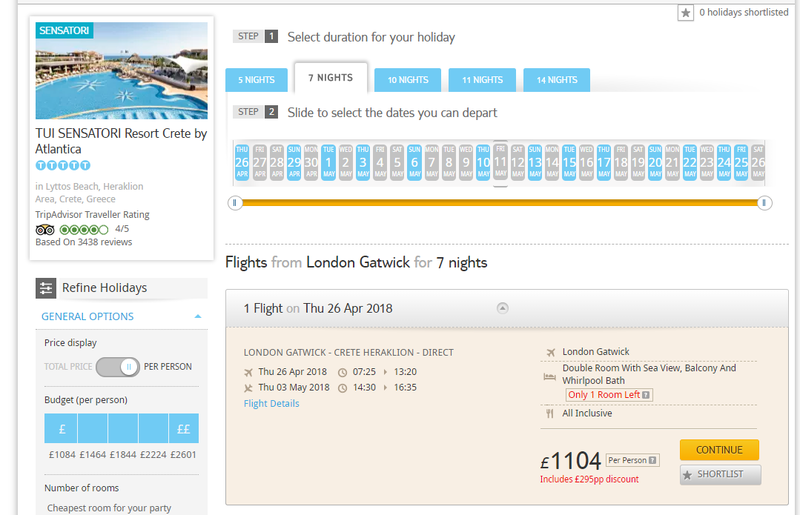 Same holiday, all inclusive in Crete this time, £1104 for myself, but if I go with a friend it’s a steal at £647 – saving me £457!!! Those of you with a business hat on will probably be thinking “Stop whinging – if a travel company can make £x per room why would they choose to only make half of that” and I get that I do. They have to pay for cleaning and air-con and other things whether the rooms have one, two or ten people in them, but I just feel that there has to be a more fair way of doing this. I’m definitely not going to be paying three times the price – that much I know! I completely agree! As a fellow solo traveller I feel ripped off as well. I spend my fair share on food and booze, why should I be penalised for not having someone to travel with? Surely filling the empty rooms with someone is better than leaving them empty? Something probably many single people do as they’re sick of being taken advantage of. We deserve reasonably priced holidays too!! That’s a good point I’d not thought of Samantha – thanks! I’m going to be spending money outside of my room as well, so it’s not like they won’t make any more money from me and other solo travellers, so they could give us a bit of a break!